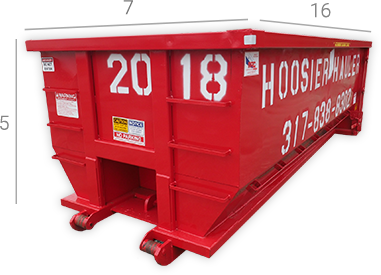 Find the right size dumpster for your project. Warning: Large quantities of material can create tonnage overages. Additional cost of $50/ton prorated on overages. Perfect for smaller clean-up projects around the house that may be too much for the weekly hauler or a weekend roofing project. These size dumpsters are mostly utilized by homeowners, contractors, and businesses who are undertaking small scale renovation projects. 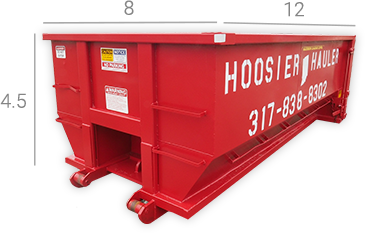 Since 2000, Hoosier Hauler has been providing business owners, home owners, industrial property managers, and many more with dumpster rentals for hauling trash and debris away from project work sites. As a veteran owned and Indiana Original company serving the greater Indianapolis area, there is a constant focus on providing our customers with the best possible value and experience for every remodeling, construction, or cleaning project. 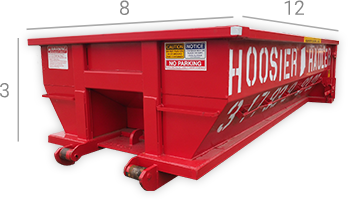 Whatever the task, Hoosier Hauler provides exceptional service that is fast and reliable thanks to a team of professionally trained and helpful employees. 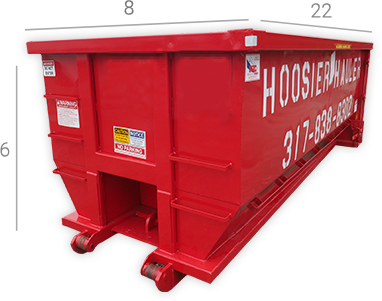 The convenience of a roll-off dumpster, especially the compact style we provide, is unmatched for both residential and commercial projects, and because every piece of equipment, every truck, and every employee is fully licensed, you can be sure you will receive the most highly qualified and consistent customer service we can provide every time. We are located in central Indiana allowing us to quickly serve the greater Indianapolis area.